Spent last weekend in Phoenix where the temperature was around 115 and the skies were so sunny!! On Friday night my first Bestie in AZ, Lisa, and Ron were married! Moving on, some photos to catch up. It's cooling off here so I pulled out my cowboys boots to wear....I bought these Nocona boots about 22 years ago!! I just got this journal back from my friend Heather Simpson Bluhm. She submitted it to Somerset last year and it was published! Thank you Heather!! 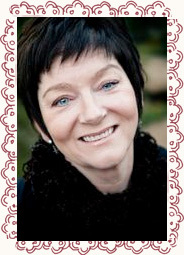 And thanks to Mary Ann Moss for teaching the BEST online classes!! In the mail....this beautiful skirt by Deb Hodge @ Breathing Beside Us! I also have to photograph the shirt and jacket that Deb made to go with it!! AU- beautiful earrings created by Ruth Rae with a garnet nestled in and etched cup! My girlfriend Tanya artfully packaged up all these goodies for my birthday! And I have to throw in my new favorite summer wine, New Age. Pour it over ice with a slice of lime and yummy!! Hammered bronze Boho earrings from Art Unraveled vendor day, crafted by my friend Deryn Mentock! You guessed it- birthday beauties from my darling Pilar Pollack! A beautiful scarf that will be perfect to help me transition through the Colorado seasons! And look at that brooch! The card it is attached to was even collaged by Pilar!! "Hope is the dream of a soul awake"..this is a recurring theme in Ruth's work, the second piece I own with this phrase. Harper, 3 months old. Scout is LOVING her!! I have been attending Art Unraveled in Phoenix for as long as Linda and Chuck Young have been putting it on. Perhaps 8 years? That was the first time I stepped into the world of Mixed Media. My very first 2 classes were taught by Kelly Kilmer! It has been a wonderful journey and I have met the most talented women in the world!! On Friday night Martha and I took Ruth's class where I got to meet my long time blogger friend for the first time In Real Life....Joanna Pierotti!! What made meeting Joanna IRL extra special was that we have been in the Adorn Christmas Swap together for the last 5 years and 4 out of 13 of us were together at the same place!! Deryn, me, Diane Cook and Dianna Frey!! Ms. Bling Baby, Lisa Loria and the Mosaic Queen, Michelle Legler! I'm heading back to Phoenix at the end of the month to visit with Lisa again for a weekend. My next post will be about the stuff I made in class! !